DESCRIPTION WOW! Step away from the busy city life and enjoy some small town living at its best. 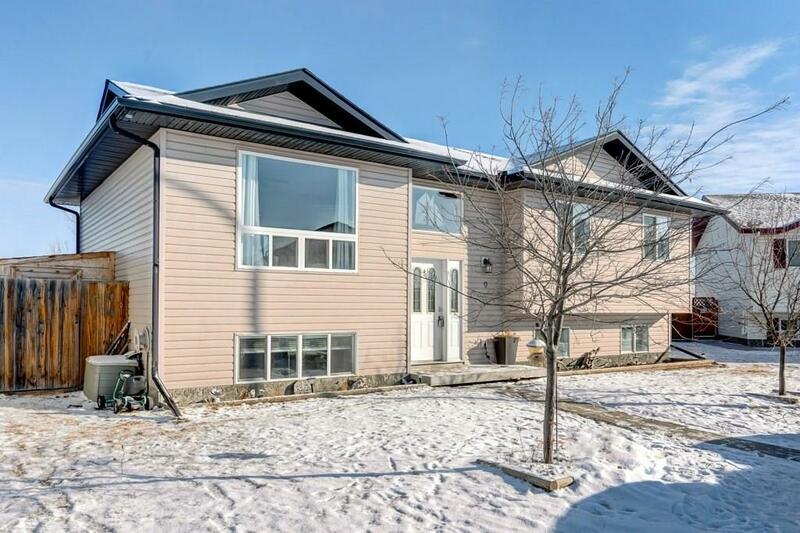 This warm family home is situated on a large beautiful lot with 2000 sqft of living space in BLACKIE! With a total of 4 bedrooms and a HUGE yard! - this home is move in ready for a new family! The main floor features 3 bedrooms with en-suite and a second 4 piece bath. The living room is open with large windows that saturate with tons of natural light. The adjoining kitchen/dining room is ready to host your next family dinner! Step out onto the large deck for your morning coffee or to watch the kids play! Lower level features a perfect entertainment space to watch movies with family, large bedroom with walk-In closet +full bathroom with stand up shower. Outside features a large shed, vegetable garden, pergola covered fire pit and ample space for recreational toys and more! Hockey rink hosts an amazing program "Hockey Skills Canada" ran during school hours as well as a bank, store for necessities and school k-8. Home for sale at 9 Scot Cl Blackie, Alberts T0L 0J0. Description: The home at 9 Scot Cl Blackie, Alberta T0L 0J0 with the MLS® Number C4225398 is currently listed at $299,000.